RGR Facilities | How do Grease Traps Work & Why do I Need One? How do Grease Traps Work & Why do I Need One? The most commonly searched query about grease traps is not where to buy a grease trap, or where to turn to get a grease trap cleaned or serviced, but rather ‘how does a grease trap work?’. While this statistic may sound surprising to those in the know about grease traps, it reveals the lack of awareness that still surrounds them, despite grease traps having been used to protect responsible commercial kitchens and caterers around the world for over a century. This lack of awareness, even among many industry professionals is reflected in the sheer number of UK restaurants and commercial caterers, with no form of grease trap or other grease removal equipment in place on their sites at all - despite the associated risks of blockages, fines, foul odours, flooding, infestations, additional costs & even site closures or prosecution for sites without sufficient grease removal equipment. In fact, a 2017 water authority inspection of local restaurants in London found that over 90% had inadequate or no grease removal equipment in place. A similar inspection in Brighton in 2016 produced similar results, with over 90% of restaurants again having inadequate or no grease removal equipment in place. With the above in mind, RGR have created this article, explaining the purpose & benefits of a grease trap, the science behind how a grease trap works, and the importance of regular maintenance & servicing, to help ensure that if your site has a grease trap, it is properly maintained and stays in good working order for many years to come. The purpose of a grease trap is given away somewhat by the name, which is autological in nature – a grease trap is literally designed to trap grease. Which raises the question of why a restaurant or commercial caterer would want to trap grease to begin with. To understand this, it helps to take a look at what happens when food is cooked. As anybody who has cleaned up after a fry-up can attest, fats, oils & grease linger in the frying pan and if left for any extended period of time, will soon cool and congeal along the edges of the pan. While a fry-up gives a particularly vivid example of the formation of fat, oil & grease following cooking, most types of food & styles of cooking will generate at least some excess fat, oil & grease that requires disposal. Although while hot this fat, oil & grease appears in liquid form, it is crucial that this is not disposed of directly to drain. Just like in the frying pan, as this fat, oil & grease is allowed to cool, it will congeal, which means that if it has been disposed of down the drain it will begin to stick to the edges, reducing the pipework diameter and leading to potential blockages, bad smells & back ups. Instead, the majority of excess fat, oil, grease & waste food from cooking should ideally be disposed of into a specified bin/sealed container, before the cooking equipment is rinsed into a sink connected to a grease trap. As the smell of used fat, oil & grease acts as an aphrodidsiac for pests & vermin, it is crucial that any container used for this purpose is properly sealed at all times once in use to reduce the risk of an infestation. While many sites opt to install biological dosing units, which help to break up fat, oil & grease as it enters the grease trap from the sink, these should primarily be used in conjunction with a manual grease trap, to break down grease inside the trap and increase the longevity between services being required. By themselves, biological dosing units are ineffective at protecting drains from blockages. Knowing why it’s important for your site to have a grease trap installed, the next question to address is how the grease trap will work to reduce the impact of fat, oil and grease on your drainage system. As stated earlier, the grease trap was initially invented over a century ago, and relies on the same principles seen in the distillation of gases and oils to function. While the waste water which enters the grease trap sinks to the bottom, and exits the trap through the outlet, the fat, oil & grease rise to the top of the trap and are contained in the central chamber by raised metal baffles. Waste food is either siphoned off by use of a sink strainer, or strainer basket, or alternatively sinks to the bottom of the trap to be removed alongside the waste fat, oil & grease. 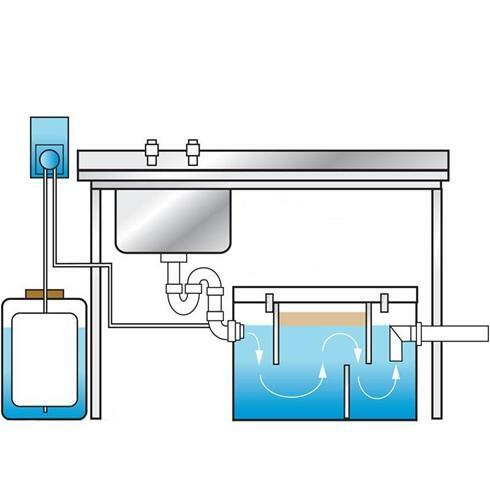 Although this basic principle of fat, oil & grease rising to the top of the trap, while waste water is released out of the bottom applies to virtually all makes & models of grease traps, more complex, automatic grease traps also siphon the waste oil from the top of the trap into a separate collection container, which can then be collected by a licensed professional and either disposed of under license, or resold for recycling. With the concept of how a grease trap works now explained, a secondary issue becomes immediately apparent - which is that if the waste fat, oil, grease & food scraps are all being stored inside the grease trap, it will eventually reach capacity and like an overfilled bin, will cease to fulfil it’s role effectively. With this in mind, there are several tasks, which any restaurant or site containing an under-sink grease trap should aim to carry out on a daily basis, in order to ensure their grease trap remains functioning at optimum capacity. Food strainer baskets should be emptied regularly, to prevent food effluent from clogging the strainer mesh and reducing the ability of the grease trap to handle sufficient volumes of waste & water flowing into the trap. Automatic grease traps with wiper blades to scrape off waste oil for collection should also be regularly cleaned, to reduce the build up of fat on the wiper blades, which reduces their operational efficiency. For oil collecting automatic grease traps, the oil collection container will also require regular emptying into a sealed container to prevent it filling up and overflowing. Though it should go without saying, this oil should not be disposed of down the drain. While these tasks can and should all be carried out by staff on site, grease traps will also require a specialist to attend several times per year, to carry out a service clean & emptying of the unit. The frequency of these visits is dependant on the volume of daily covers and type of food served by a site. During these visits, the grease trap is emptied and cleaned, and any parts requiring replacement will be flagged up with the site. All waste is then disposed of under license. By ensuring these visits take place regularly, sites can ensure that their grease traps maintain their effectiveness – as if they are not carried out, and the grease trap reaches capacity, it will cease to function effectively, once again allowing fat, oil & grease to escape to drain, and negating the entire point of having the grease trap installed in the first place. To find out more, feel free to get in contact with RGR today, either by giving us a call on 020 7221 6094, or by emailing info@rgrfacilities.co.uk and we will see what we can do to help. Whether you need RGR to carry out grease trap cleaning & maintenance, replace or install a grease trap, carry out a CCTV or jetting on your pipework, or anything else to do with your grease trap, grease removal equipment & drainage systems, RGR are just a phone call away and can attend sites anywhere in the UK in as little as four hours in an emergency. For further facts, news & updates about grease traps, grease removal units & all things grease related, be sure to follow RGR on social media, either on facebook, linkedin or twitter, where we provide daily tips & updates about our goings on. We look forward to hearing from you.